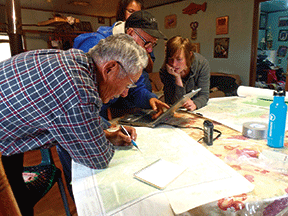 Sarah McCloskey (U.S. Geological Survey) verifies place names on USGS topographic maps with Elders, (left to right) Benedict Jones and Franklin “Kaki” Dayton Sr. in Koyukuk, Alaska (photograph taken by Catherine Moncrieff, Yukon River Drainage Fisheries Association). Koyukon Athabascan peoples have settled along the Koyukuk River in Western Interior Alaska for thousands of years using the surrounding landscape for subsistence and cultural resources. However, recent changes in climate, technology, resource availability, and way of life have affected land-use patterns in the region, as well as use of the Denaakk'e (Koyukon) language. The current Koyukon population is about 2,300, and about 150 still speak the language (the youngest of whom are in their fifties). In addition, Elders, important keepers of both language and traditional subsistence-use areas, are aging, and opportunities to record their knowledge are diminishing. Study area map representing the 366 spatially verified place names along the Koyukuk River from Koyukuk to Hughes. Karin Bodony (U.S. 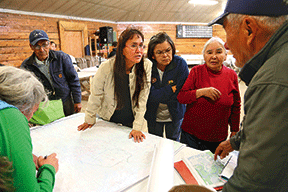 Fish and Wildlife Service) with Elders and community members, (left to right) George Yaska Sr., Shirley Sam, Elsie Vent, Eliza Jones, and Benedict Jones, review maps at a meeting in Huslia. Shirley Sam listens to Benedict Jones as he shows her where her parents and grandparents had camps (photograph taken by Susan Paskvan, Yukon-Koyukuk School District). 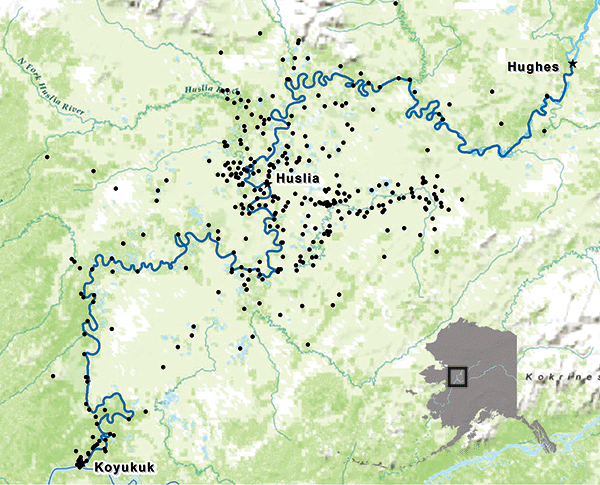 The goals of the place names project are to collect, preserve, cultivate, and pass on the rich knowledge and culture of the Koyukon people with regards to traditional place names and subsistence-use areas along the Koyukuk River in the villages of Koyukuk, Huslia, and Hughes. Place names provide important information regarding navigation, resource availability, cultural history, land ownership, and changes in land use. Archiving information of this nature assists in passing local and traditional knowledge to subsequent generations. To achieve project goals, the U.S. Geological Survey (USGS) is working in collaboration with a diverse group of team members, including the Yukon-Koyukuk School District, U.S. Fish and Wildlife Service, Yukon Drainage Fisheries Association, and knowledge holders from the region, on the documentation and the placement of traditional place names. The project began by collecting hundreds of existing place names from Alaska Native Language Center (ANLC) archives, synthesis of previous work on place names, and pertinent literature. Next, the team traveled to the Koyukuk River communities of Huslia, Koyukuk, and Hughes to meet with Elders and community members to identify and verify place names on USGS topographic maps (fig. 1) and to receive feedback from local communities regarding final product preferences. The team also presented the project to local students. Information collected from place name interviews (including place name source, alternate names, alternate spellings, place name meanings, and associated stories) were integrated with the place name location into a geospatial database (fig. 2). The final database was proofed and archived at the ANLC. In addition, Elders, youth, and the project team traveled by boat along the Koyukuk River and posted traditional place name signs along the route (fig. 3); engaged Elders and youth along the river corridor; collected environmental data; and delivered presentations at community centers in each of the three villages. Interviewed nine Elders in the village of Huslia, three Elders in the village of Koyukuk, and two Elders in the village of Hughes. Created a database to catalog 675 place names and a geodatabase with 366 place name locations. Collected video and voice recordings of place name stories, meanings, and pronunciations. Located six previously undocumented old and current winter trail systems. Integrate traditional place names from this project into the USGS Geographic Names Information System (GNIS). Create a river atlas and various map products for publication and distribution throughout the Koyukuk River region. Create an interactive website that integrates place names with recordings of video and voice interviews. Incorporate traditional place name information into climate change studies. 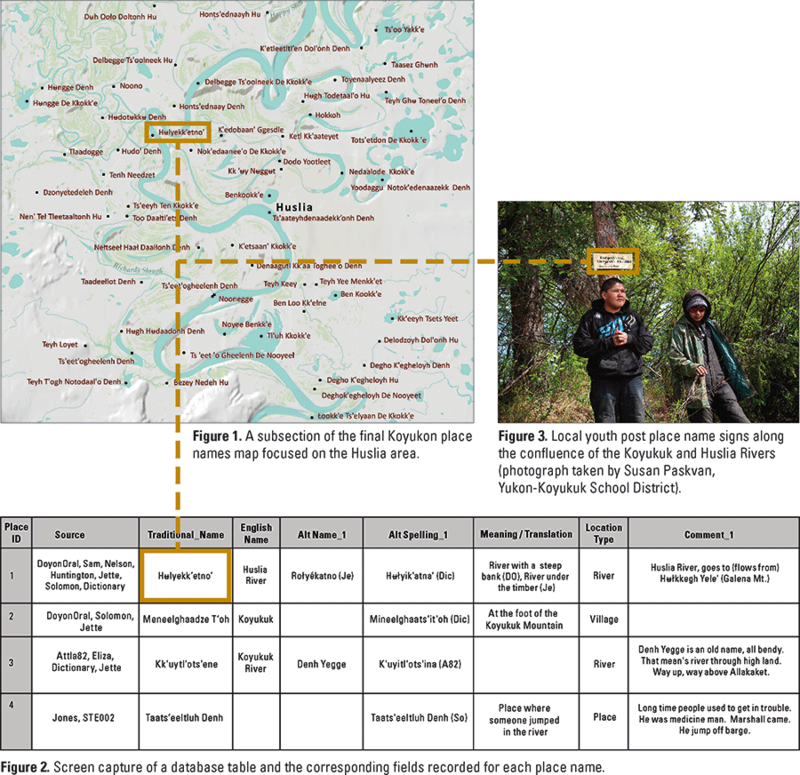 McCloskey, Sarah, Jones, Eliza, Paskvan, Susan, Moncrieff, Catherine, Bodony, Karin, Toohey, Ryan, and Jones, B.M., 2014, Mapping traditional place names along the Koyukuk River—Koyukuk, Huslia, and Hughes, Western Interior Alaska: U.S. Geological Survey Fact Sheet 2014-3105, 2 p., https://dx.doi.org/10.3133/fs20143105.